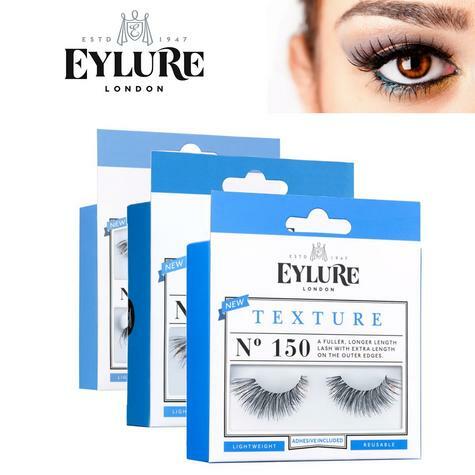 Eylure Texture lashes style 117 are long and angled with a twisty, messed up finish! Eylure 117 lashes give you a little extra length and thickness to enhance the natural beauty of your eyes. The limited Edition Eylure "Love It, Layer It" kit offers you the opportunity to customise your favourite lash and layer up the outer edge for the ultimate look! Eylure Texture Lashes 117 feature a long, angled style with a twisted, messed up finish. These wispy-looking lashes are hugely popular and they can be worn for almost any occasion. Eylure lashes are contact lens friendly, easy to apply and reusable if removed carefully after each use. Eylure Texture Lashes in style 150 are fuller, longer length lashes with extra length on the outer edges, they're sure to turn heads! This amazing new style is brand new to the Eylure range for spring/summer 2016. Please note - This item is classified as a Hygiene Sensitive item which will not be refundable or exchanged within the 30 days of purchased if used. We urge you to please do all the necessary research on the item prior to purchasing as to ensure that it is indeed going to serve its purpose.